One of the challenges teaching nursing in Broward County is that many of the students speak English as a second language. While working on a communication lecture, I searched the Internet for examples of misunderstandings in the English language. I couldn’t find the site again to reference it for you, but one of the quips was about Odds and Ends. If you have Odds and Ends and give them all away except one, what’s left? An Odd or an End? While I was at the gym today, David, my personal trainer, commented that duct tape is good for wart removal. I Googled it. He’s right. The article at http://www.warts.org/duct-tape-wart-removal.html says that the warts need air to thrive and covering them with duct tape deprives the virus of air. My friends and family know my thing for hot cars, red ones in particular. I’ve had several. Actually, modest models. Ones that anyone can spell. Lam bur . . . Lamborhi . . Lamborghini? Machetti. . . Maseretti . . .Maserati? Who makes up these names? If you can’t spell it, you obviously can’t afford one. I can spell Toyota MR2, Nisson 360 ZX, Honda S2000, and BMW 330 just fine. 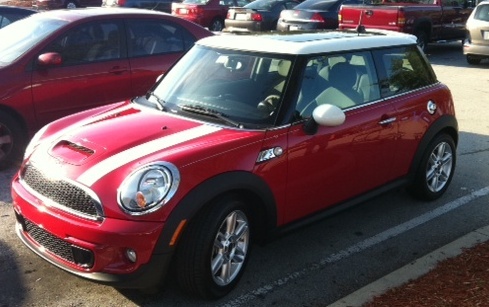 Then I got a 2008 red Mini Cooper S. It provided the necessary color, transmission, and pep. It also provided six airbags and solid construction along with a fun look. I don’t think my reflexes are what they used to be and need to drive something a bit more sensible and fitting. But alas, I had to sell my Mini before its time and have missed it ever since. I got a brand new Mini Cooper S! If you go through the previously posted pictures, you’ll see that it looks exactly like my 2008, right down to the pin striping. It’s amazing how the look did not change from 2008 to 2011. Oh . . . and I can also spell Mini! Love it! Can’t wait to see it! Enjoy! It’ll look familiar to you. Zoom Zoom. Just remember that most people INTERPRET post speed limits here in South Florida as GUIDELINES not actual spped limits! And you thought flying was a chore … I figure if I can make it from my house to the American Airlines front door at MIA in one piece, the rest is a piece of cake! Well, save for L.A.